Dr. Jensen is the dean of the LeBow College of Business and associate professor of economics. His primary research areas are international trade and applied microeconomics. Dr. Jensen has served at LeBow for 20 years and has held several roles in administration and leadership within Drexel University. 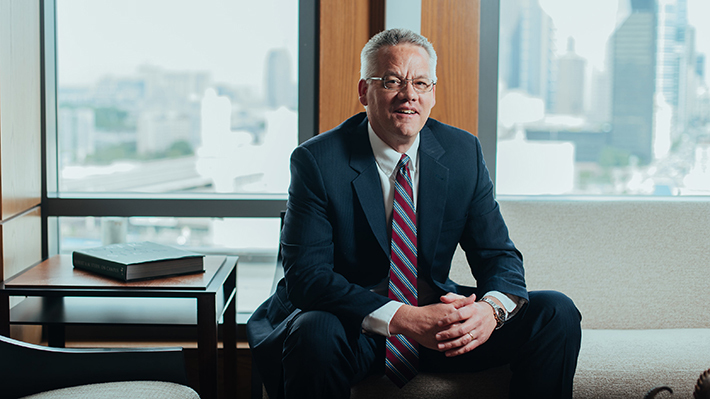 He previously served as associate dean for LeBow’s graduate and undergraduate programs and office for experiential learning, director of LeBow’s PhD program and interim director for the Center for Hospitality and Sport Management. Prior to his appointment to LeBow’s economics faculty in 1997, Dr. Jensen began his career as an engineer at General Electric. He received his PhD from Penn State University. Paul E. Jensen named Dean of Drexel LeBow College of Business after serving as interim dean. The Drexel LeBow Dean’s Advisory Board met to elect a new member and share anecdotes and career advice with current students. Jensen brings a wealth of experience in a variety of leadership and administrative roles at the University. Leaders from SEI, Pfizer and Mars Drinks addressed Drexel alumni at an event focused on leveraging Drexel’s research and innovation capabilities to solve business challenges.